Television by satellite came to Australia in the mid-1960s — with two special event programs that brought the world to bleary eyed Australians in the early hours of the morning. The first such program was a live coverage of Australia’s contribution to Expo 67, being held in Montreal, Canada. 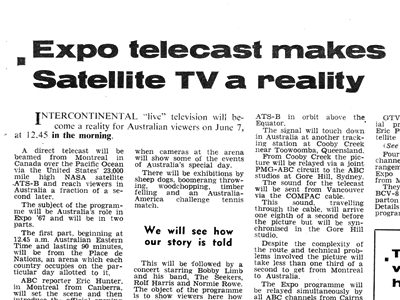 Tuesday, 6 June 1967 was “Australia Day” at the Expo and it was heralded with a live satellite transmission to Australia’s eastern states and South Australia. To bring the pictures to Australia, the signal was first directed from a Canadian Broadcasting Corporation (CBC) outside broadcast van situated at the Expo site. From there the signal was sent by microwave to the NASA satellite tracking station at Rosman, North Carolina. 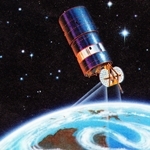 The Rosman station then sent the signal across the Pacific Ocean via NASA’s ATS-B satellite in orbit above the equator. The signal was then picked up in Australia at the tracking station located at Cooby Creek, near Toowoomba, Queensland. From there the signal is carried via the PMG-ABC microwave networks to the ABC studios in Gore Hill, Sydney. 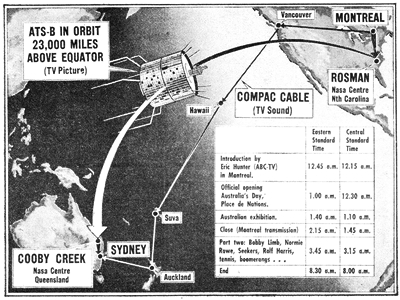 While all that was going on the sound component of the broadcast was delivered via a different route — via the COMPAC cable that connects Vancouver to Sydney via Hawaii, Fiji and New Zealand. Because of the two different methods of transmission, the sound was due to arrive at Gore Hill around an eighth of a second before the pictures come in via satellite. It was at the Gore Hill studios that the two components were to be synchronised up. 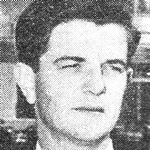 Given the time difference it was 12.45am (AEST) on Wednesday 7 June when ABC reporter Eric Hunter (pictured) introduced what was the first direct satellite transmission from the Northern Hemisphere to the Southern Hemisphere. This was followed at 1.00am by the official opening of the day from Expo’s Place de Nations — the arena which each country occupied on its particular “national” day — including a speech from Australian Prime Minister Harold Holt. At 1.40am the telecast switched to a half-hour pre-recorded presentation of Australia’s exhibition at Expo. At 2.15am the first part of the telecast came to a close. Viewers had a 90-minute break — and perhaps some sleep — before transmission from Montreal was scheduled to resume. The second installment of the telecast commenced at 3.45am. Viewers were treated to coverage of some of the demonstrations taking place at the arena — including sheep dogs, woodchopping, timber felling, boomerang throwing and an Australian-American tennis match. Then came the entertainment highlight of the day, Pop Goes Australia! 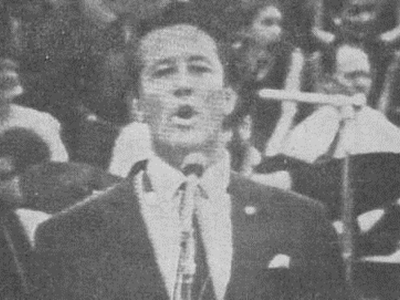 The concert featured entertainer and TV host Bobby Limb (pictured as he appeared on screen) and his band, pop star Normie Rowe, singing group The Seekers and performer Rolf Harris. The telecast came to an end at around 8.30am — leaving many tired viewers to face the new day with very little sleep. Limb wrote of his experience of the event for TV Week: “We had been warned that the people were not friendly, two-thirds of them only spoke French — and that they were the toughest audience in the world. 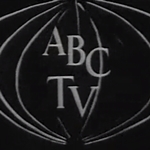 Although ABC was the Australian host broadcaster, given the technical significance of the event the program was also simulcast through the commercial networks, who all broadcast the program commercial-free. In Melbourne, HSV7 supplemented its coverage with a 15-minute preview before the ABC’s introduction, and GTV9 also added a half-hour program, It’s A Big Wide Wonderful World, which documented the history and previous efforts at bringing long distance television to our screens. Expo 67 was shown live across the eastern states, stretching from Cairns down to Hobart, and across to Adelaide and Port Pirie in South Australia. With no direct link to Western Australia, viewers in that state were to see a videotaped version of the program a few days later. 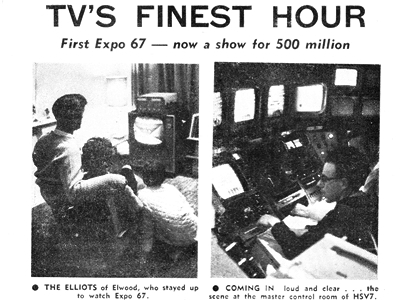 The history making Expo 67 broadcast was to serve as a prelude to a much larger television event. Later in the same month, more than 500 million viewers around the world were expected to witness the two-hour global television event, Our World. Australia was one of 14 countries to contribute to that program.